Should you one day receive a request from Mr. Inäbnit from the PRELLBOCK publishing house in Szwiterland to use one of your pictures for a book, please just ignore his request and do not send any photo to him. For more details, please read the below mail that I have sent to Mr. Inäbnit last Tuesday. As of today, I still did not receive any feedback from this Gentlemen. On January 17, 2018, you contacted me via Railpictures.net asking for permission to use two of my photos for your new Furka book. The same day, I sent you a high resolution version of these two photos. As a thank you, you wrote that you would send me a copy of the book after it was published. According to your website, the book "Die Dampflokomotiven der Dampfbahn Furka-Bergstrecke" was published on October 15, 2018. To this day, I have not received the copy of the book you promised to forward me. I have sent you two emails (21st of December 2018 and 25th of January 2019) to kindly remind you of your promise. Sadly, I received no response from you following these two emails. I deplore your behavior which is very dishonest. You do not respect your word. It is understood that you will not receive any more photo from me for any other new request from your side. Several of my photos have already been published in magazines and books worldwide (USA, Germany, Great Britain, Sri Lanka anf France). For this, I have always been rewarded either by a money payment or by sending a copy of the magazine or book. Please do not forget that small publishing houses like Prellbock depend heavily on the collaboration of the many hobby rail photographers like me. Without them, you would have trouble finding the necessary documentation necessary for your books. I will post a note on the Railpictures.com forum to warn all photographers around the world of your dishonesty. I am sorry to have to write this, but you have forced me by your lack of honesty and respect. Sadly, this happens quite often. An author or publisher will contact a photographer asking for a high-res image to be used in an upcoming book, generally promising only a copy of the book vs. any monetary compensation. And then, silence...... The book gets published and no copy ever materializes. Some will correct the error immediately when contacted. Some simply don't respond to the contacts. Magazines and calendar publishers are usually pretty good. That's probably because they have near-term deadlines and dealing with license feeds is what they do. Books seem to have less aggressive schedules and I think most of them just simply forget over time. Once the book is published, most of them have a ton of extra copies and it's no skin off their back to send one to a photographer. Honestly, I approach RP.net e-mails with a lot of caution. Most of them are asking to use a photo for one purpose or another, but offer nothing to the photographer. They want the photo, but by not offering even a token compensation, they're essentially telling the photographer it is worthless. Many don't even provide a name or contact info. Generally speaking, if the party does not identify themselves and provide me with a way to contact them (other than replying to the RP.net e-mail), I don't answer them. Unless they mention financial compensation in the request, I say no. Fame in the foamer world doesn't interest me in the least. There's been a few good ones come through RP however. Saint-Gobain for one was an absolute pleasure to work with. Last edited by bigbassloyd; 02-01-2019 at 02:46 PM. Watched some videos. German speaking part of Switzerland I guess. Steam rack railroad, pretty neat, restored section of mountain pass. Last edited by RobJor; 02-01-2019 at 10:54 PM. The line is absolutely fantastic and the Rolling stock superbly restored. 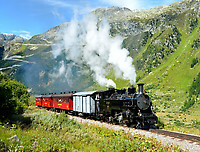 A few steam locomotives have been brought back from Vietnam to Switzerland and are now running over the pass like new. You will find plenty of superb photos of this line on Railpictures.net. Here are the two photos unfairly used by Prellbock for their book. Thank you, Daniel, for warning us and starting this thread. The same story happened to me with a US publisher. I provided him with a selection of pictures. Then several times over the years, Jason promised to send me a copy of the book ( most recent was in July 2018 ), which never materialized. However, the book is still for sale on his web site. https://jovideoproduction.net/collections/all. The number of reminder emails has increased over the years to no avail. So, if I understand well, this gentleman (not sure about “gentle”) is making money selling books made with pictures he does not dare to pay even with one complimentary copy. I am happy to warn the RP community. It would be a good idea to keep this thread alive and feed it with testimonies of the same vein, to keep a log of deceitful publishers. I highly suggest entering into a written contract for any request of usage, even if there is no compensation requested. Verbal agreements carry little to no weight when you're the one getting screwed over. If the other party is honest, they will take no issue with a little bit of paperwork. Yesterday, I have sent a registered letter with acknowledgment of receipt to this "gentleman". I am curious to see how he will react. I have exchanged emails with the publisher. It should be enough. Still trying to pick myself up off the floor laughing! Good luck with that. Today, I have received the confirmation that my registered letter with acknowledgment of receipt was distributed to Mr. Ignäbit, Manager of the PRELLBOCK editions. I was expecting a reaction from him, which of course did not happen. This confirms my initial impression. Mr Ignäbit is a crook.